Gamers: give them the tools and they will build. Dongs, usually. 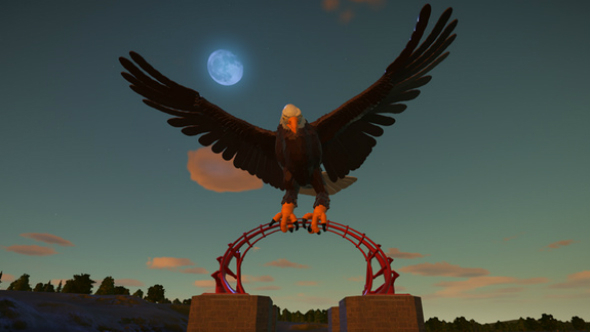 Planet Coaster’s tools are simple enough, but already the game’s community has churned out ready-made buildings, coasters, and ATMs so intricate and imaginative that you can only assume they were created by actual magic. There are also lots of Star Wars creations, because according to our in-depth sociological studies, there’s some overlap between people interested in videogames and those into ‘70s sci-fi. Related: for more creativity run amok, check out the best Minecraft mods. 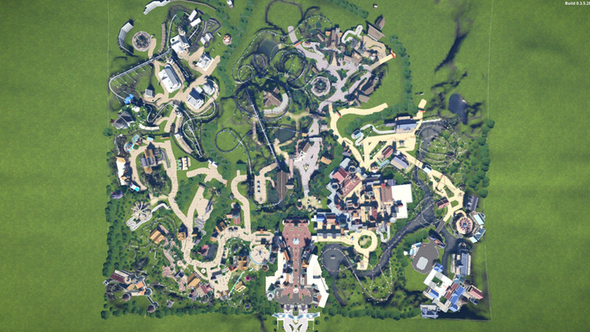 Thanks to Planet Coaster’s blueprints, copy and pasting your way to a beautiful, fully-functioning park is easy. 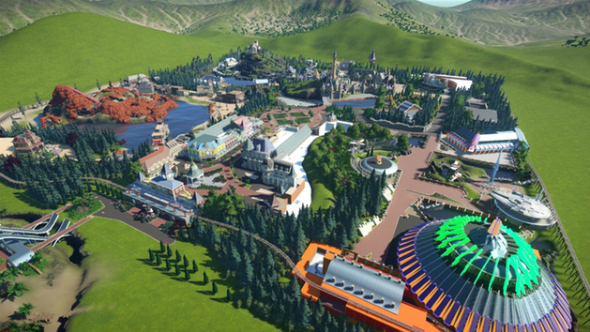 So after plenty of time spent scouring the Steam Workshop, here are the best Planet Coaster community creations. No theme park is complete without hundreds of themed buildings and constructions that we assume house the park’s army of janitors. Don’t feel bad for them because of all the vomit they deal with – their accommodation more than makes up for it. Sure, it serves absolutely no purpose, but it’s an impressively detailed replica of an AT-ST. An excellent addition to any sci-fi themed park area, and essential for any Star Wars builds. As we all know, every theme park in the world has a Wild West-themed area full of wooden coasters and creepy animatronic prospectors. This building is an ideal asset for fleshing out such areas, and a great bit of scenery to distract visitors from lengthy queues. This homage to one of the worst films of the ’90s is probably the most bizarre creation on the Steam Workshop. 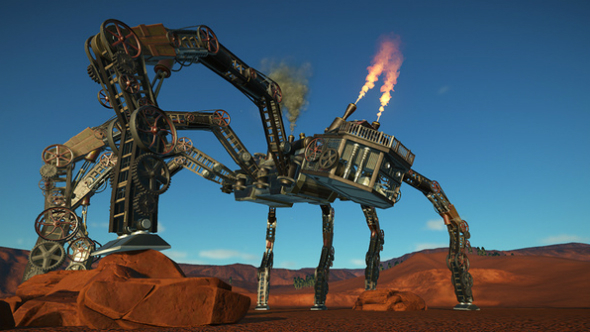 Not because it’s a giant steampunk spider, but because someone with the ability and tools to make anything chose to make this, the CGI monstrosity from Wild Wild West. 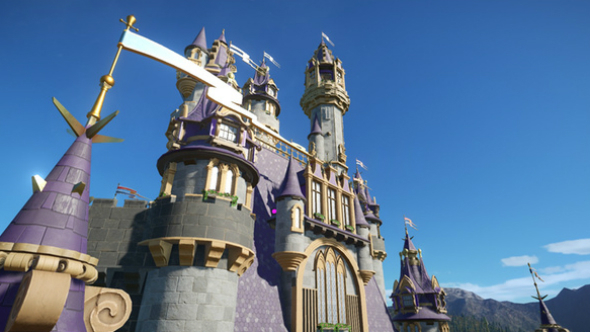 Putting some of these buildings to shame by virtue of its size and complexity, Princess Amelie’s Castle is a stunning build that houses a couple of shops, and a special area for a Princess Amelie entertainer. 2,000 pieces might seem excessive for a couple of shops, but whether you use it as the focal point of your park, or a distant piece of scenery, it’s fantasy-themed brilliance through and through. 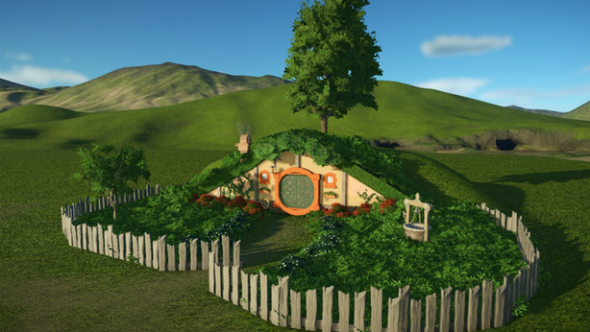 A simple build, but one no self-respecting Tolkienite would be without, this loving recreation of Hobbit Hole looks right at home in any fantasy-themed park. 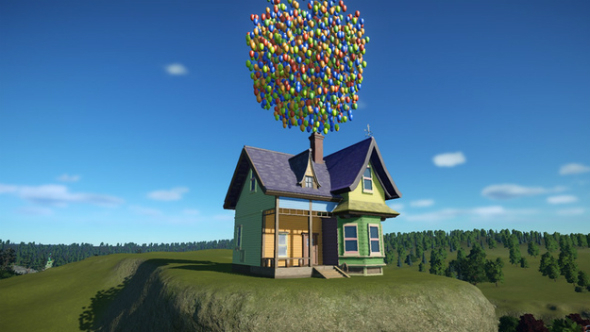 While you might struggle to put an entirePixar-themed park together, this whimsical build requires very little space and delivers plenty of charm to your park. Better still, you can place it as a floating object, making it a perfect easter egg. 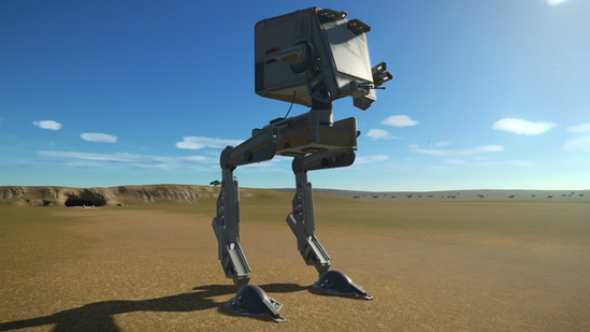 Building an entire Star Wars-themed park isn’t as tough as you might have thought, as Planet Coaster’s community have been building highly-detailed props by the bucketload since launch. 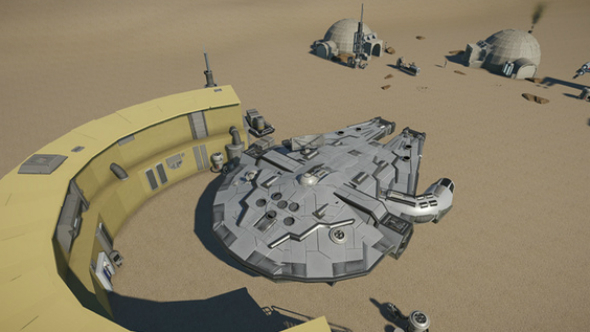 This is the best of many Millennium Falcon builds we could find, mainly because it comes with a couple of additional Mos Eisley props to really cement it’s place in your park. 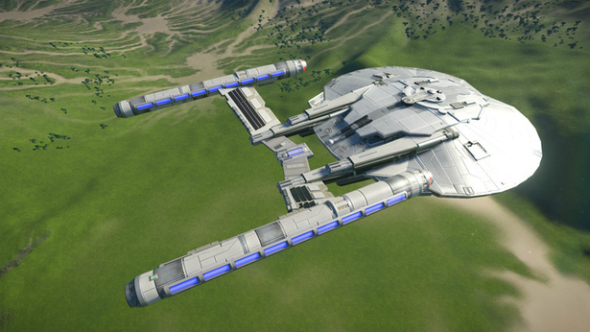 Fight back against the tide of Star Wars creations on the Planet Coaster Workshop with this impressive replica of the Enterprise. Whether you leave it suspended high above your park to mess with your guests or pepper it with future-themed food stands, it’s a great prop for any park. As much as we love pretty things, buildings that have uses are even greater additions to your park, mainly because they can make you money. And everyone loves money. 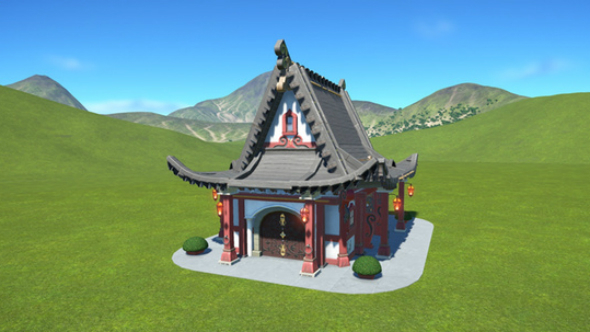 If your theme park is already full of serene pagodas and cherry blossom trees, a bog-standard toilet block simply won’t cut it. Add some whimsy to your guests’ bodily excretions with this charming themed toilet. If you’re after something significantly less subtle, this gigantic, fire-breathing hot dog stand might be for you. 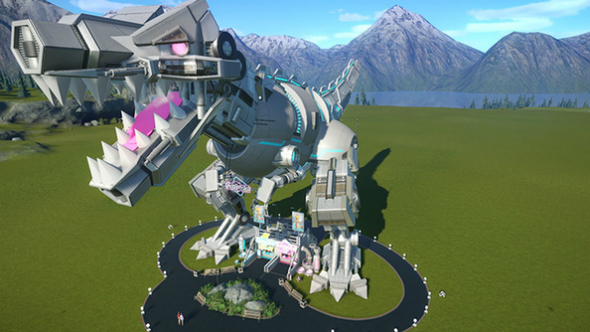 Another enormous sci-fi themed food stand, this formidable robo-Tyrannosaurus-Rex has two drinks stalls at his feet. A tad excessive, but an impressive build nonetheless. This collection of themed shops is only a gallows and a tumbleweed away from absolute Wild West perfection. 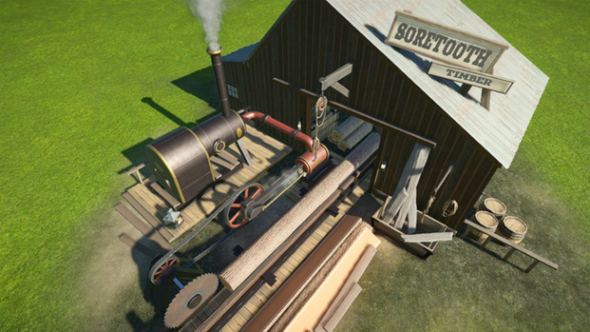 Thanks to the corner shape of this blueprint, it’s great for attracting customers between rides. 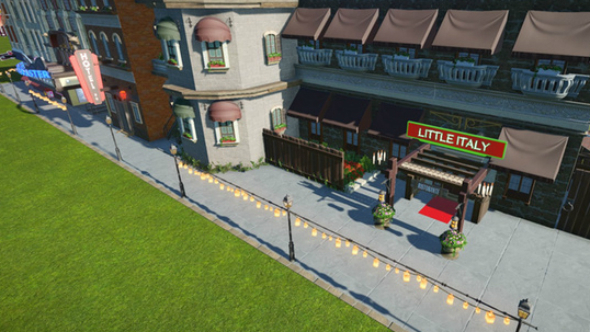 Complete with its own Little Italy section, this New York-themed row of shops is space-efficient and realistic in the tackiest sense of the word. If you’ve got a lack of space and a desperate desire to feed consumerism, this Megaton-alike collection of scrap metal is the futuristic shopping space of your dreams. Coasters are great, but family-friendly rides are the bread and butter of any successful theme park. Spruce yours up with these ride skins. Struggling to achieve a perfect queue rating for the Forge ride? 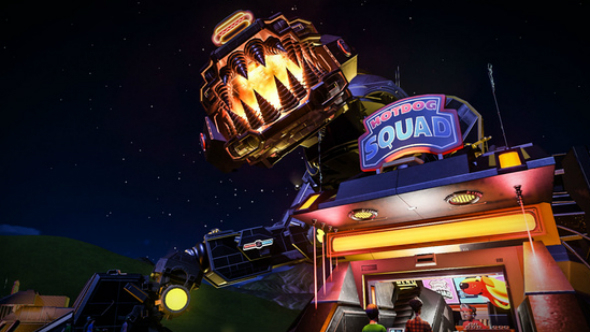 This ride skin is both thematically sound and will keep your guests distracted while they wait to get thrown about in the air like underwear at a rock concert. 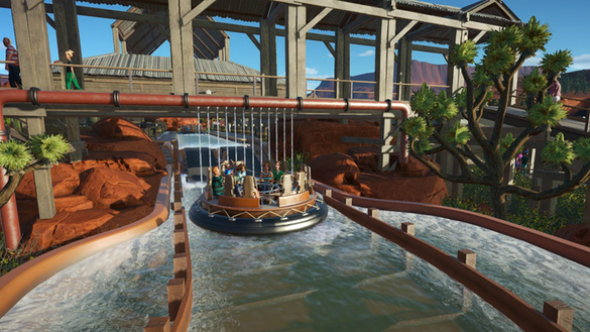 While a humble ride skin won’t make this affront to adrenaline junkies any more exciting, it does at least ease the pain of having to include it in your park in the first place. 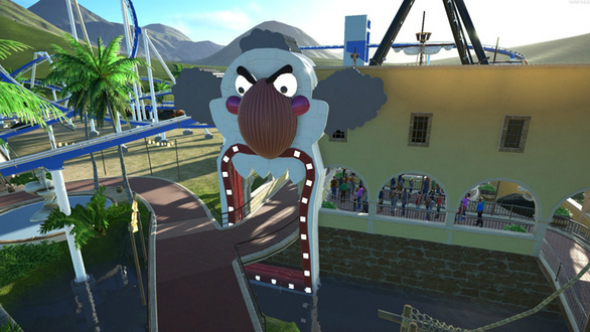 Planet Coaster creations don’t come as inoffensive as this. 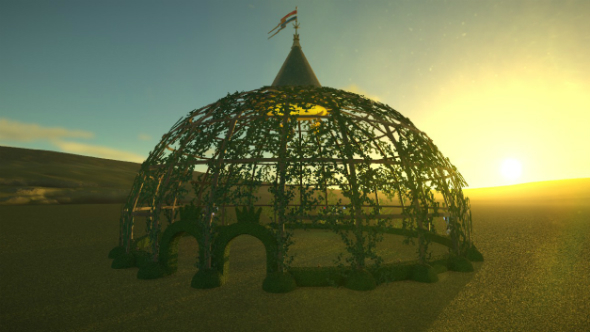 This ride skin ticks all the boxes: it’s got shops built into it, fits elegantly around the Sundial ride, and is perfectly styled for any fantasy or medieval theme park areas. It also boasts a 100% queue rating and promises to bring in plenty of money from hungry and thirsty guests. 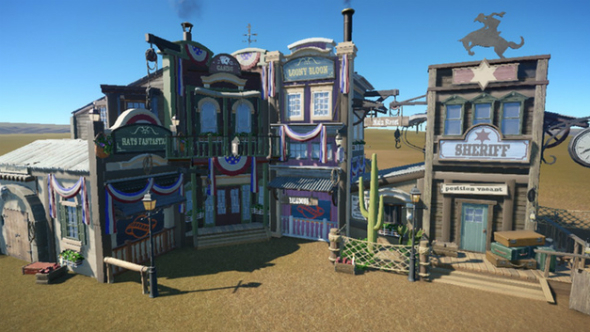 Make the ultimate statement to your guests with one of these Planet Coaster park entrances, from the straight up imposing to the joyously creative. 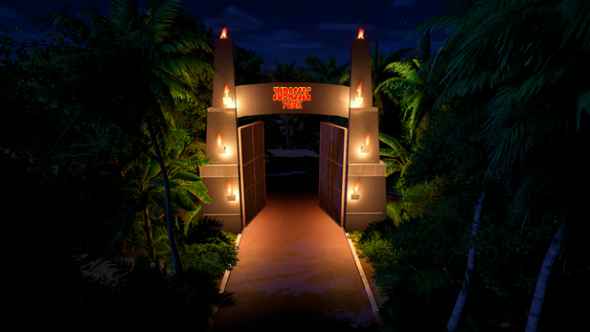 A painstaking recreation of the greatest park entrance of all time, perfect for any dino-themed parks. Freedom. If that’s not reason enough to strip away your current park entrance and replace it with this imposing / reassuring bald eagle statue, I don’t know what is. Here’s a great way to alienate guests: force them to enter your park by walking into the mouth of a screaming, deranged clown. It would probably deter people in real life, but part of the magic of Planet Coaster’s virtual guests is that they don’t have illogical fears to stop them from doing things that would make some real people run away in fear. Scenery doesn’t just make you park look nice, it’s essential in distracting guests during long queues. But mostly it’s for making your park look nice. 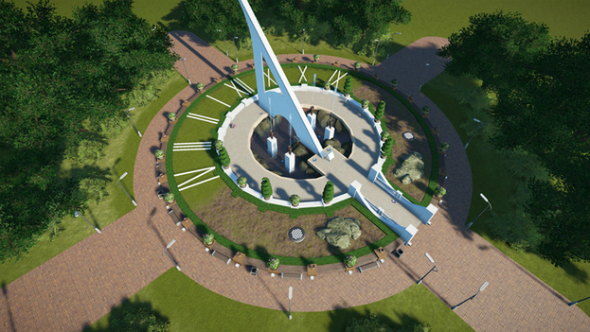 The UI might tell you the in-game time, but how are your guests meant to know when to stop for a spot of lunch if your park doesn’t have a sundial? Forget smartphones and wristwatches, the sundial is a bona fide classic. You’ll need to place the numerals manually and tweak the surrounding terrain a wee bit, but once all the creases are ironed out you’ve got an idyllic and functional slice of scenery for your guests to marvel at – mysterious ancient tech is always a winner. 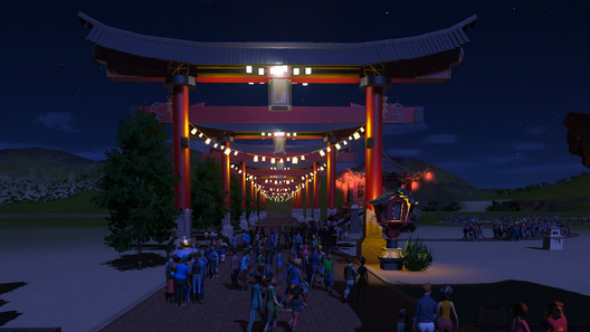 These are essentially giant lantern-lit archways designed to wrap around the paths of your park. These aren’t the most eye-grabbing bits of scenery, but they go well if you’ve adopted a Japanese style for your park. Druids probably wouldn’t enjoy roller coasters, but theme park enthusiasts will surely enjoy this remake of the world-famous collection of rocks. 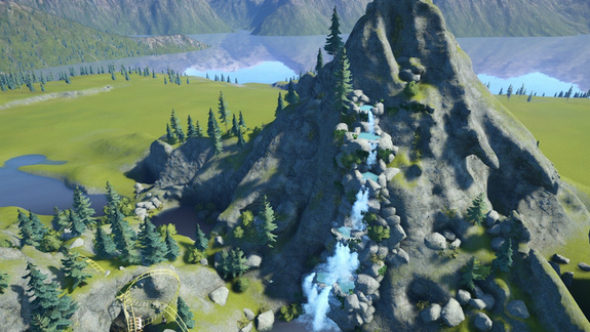 Use this ready-made feature to spice up your park’s surroundings or try to weave a roller coaster through it to truly exploit this neat slice of scenery. Water features are an essential part of any park, filling the air with chlorine and providing a slow but steady source of spare change from anyone passing by. 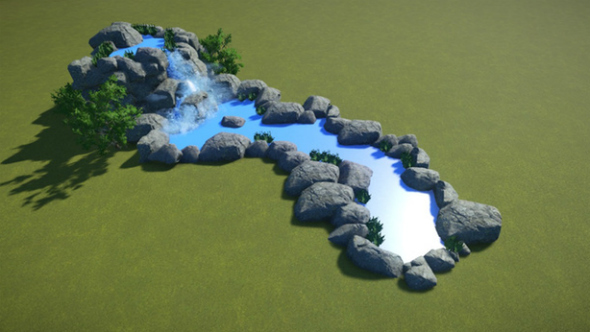 Of course, you can’t collect spare change in Planet Coaster, but at least you can satisfy any bored guests with this versatile waterfall. 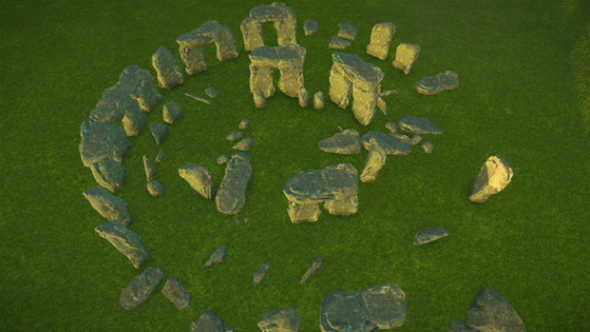 It might not be huge and foreboding but you can place it almost anywhere in your park. For a more impressive water feature look no further than this mountainous fall. To place it, you’ll need to first make a mountain, but once that’s done all you have to do is paste this blueprint in and sculpt some of the terrain to meet it and voilà! 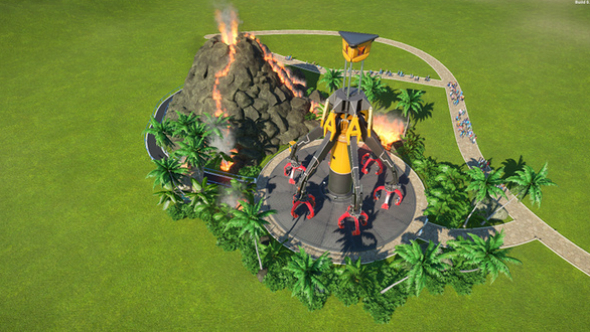 You’ve got the perfect spot to drop a coaster into or place a queue by. That parks in Planet Coaster seem to stay open 24/7 is both a blessing and a curse. You might spend forever making your park beautiful by daylight only to discover it’s barely lit and aesthetically barren by night. 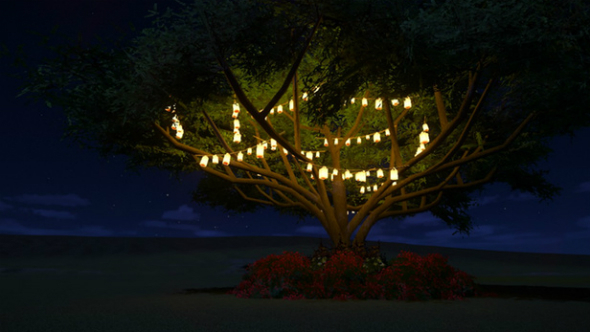 That’s where this super simple bit of scenery comes in handy, letting you place trees around your park that light it up at night with fairy lights strung up around their branches. 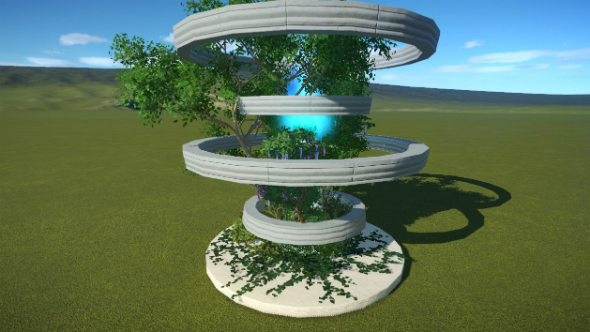 Another subtle piece of shrubbery, but with an imaginative sci-fi twist: random marble rings levitating around it. Some hidden light sources make this blueprint particularly pretty at night. Building coasters that are fun, not too scary and won’t make your guests sick is a tricky science in Planet Coaster. Making those rides good to look at is even more difficult. 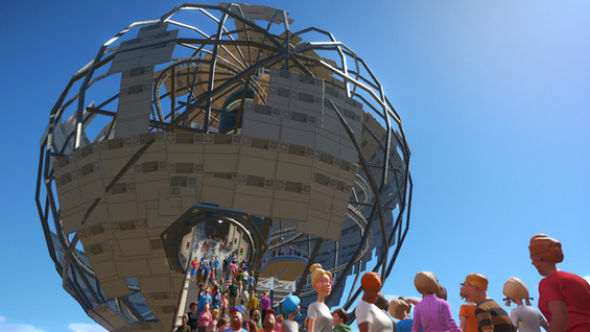 Thank your favourite deity for Planet Coaster’s community, because they’ve done all the hard work for you. Nothing evokes thoughts of a fun day out with the family quite like a roller coaster themed around a dead boy, who dies again, and again, and then a few more times after that. 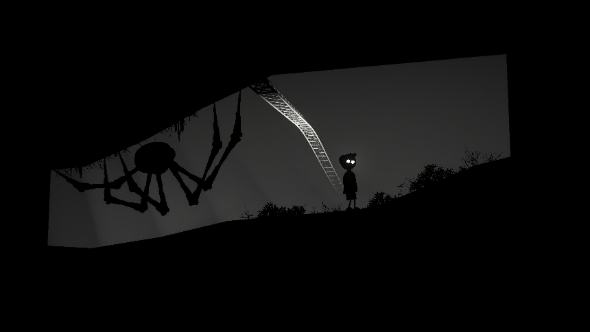 This wonderfully creative coaster fires your park’s guests past a storyboard selection of still scenes from the game, with an oppressively bleak custom soundtrack to really hammer home the tone ofPlaydead’s acclaimed game. It was only a matter of time until someone made a literal representation of the game’s name. 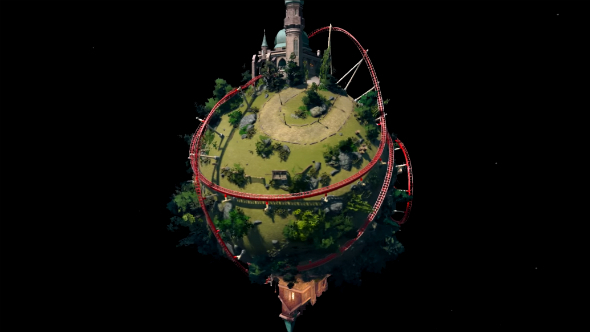 This coaster literally wraps around a spherical lump of terrain that creator Silvarret has somehow suspended in mid-air. What it lacks in accessibility, it more than makes up for with sheer creative genius. This ingenious Death Star coaster is an ingenious solution to a Star Wars park without any corresponding rides. 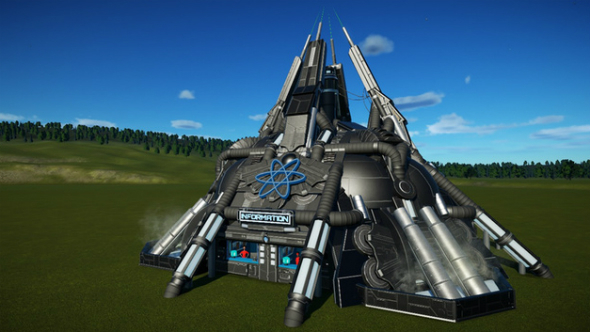 With a track that loops around the inside of the Death Star, darting around the queue doubling back on itself in an instant, this launched coaster is an ingenious example of what can be done with Planet Coasters coaster creation tools. Just keep a janitor nearby to deal with any nauseous guests. Need a top attraction but only have enough space for a small ride? 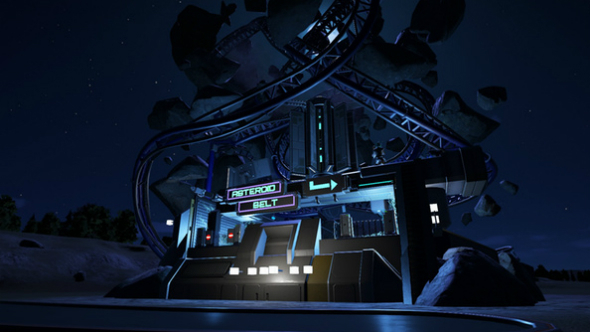 This teeny-tiny coaster has you covered, offering plenty of thrills with a track that’s tightly wound around and woven through a cluster of asteroids. Coasters aren’t all about making your guests sick, and Rio Bravo knows this, catering to families rather than thrillseekers. Rio Bravo is a Wild West-themed water ride replete with props and indoor sections. What this ride lacks in speed and adrenaline, it more than makes up for with special effects and scenery. Look, we get it, you don’t have time to use any of these and you just want to jump right to the finished product, change a couple of things, and invite your mates over so you can tell them you built the whole thing from scratch. We’ve got you covered: these are the best entire parks the community has to offer. 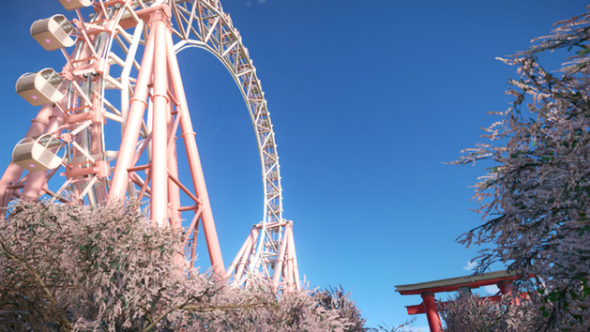 While this Japanese-themed park might be light on coasters, its aesthetic consistency and tranquility makes it one of the most spectacular complete builds around. Walkways are lined with lanterns and cherry blossom trees, there are hot springs and streams present around every corner, and family-friendly rides to cap off that peaceful park vibe. 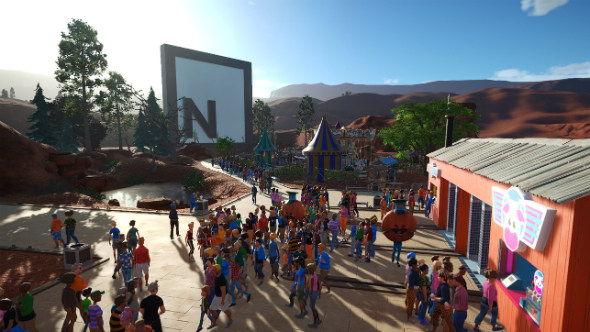 This park has had 300 hours poured into it since the launch of Planet Coaster’s alpha, and as such it’s one of the most comprehensive and well-rounded parks in existence. Probably. 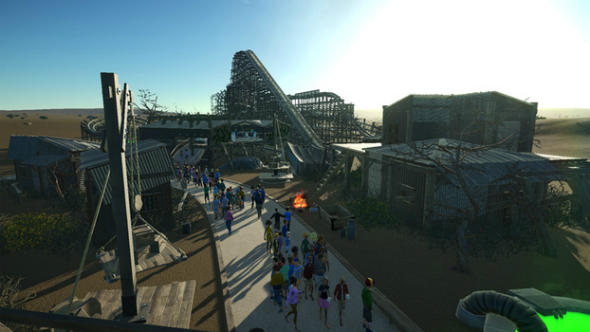 Post-apocalyptic theme parks are surprisingly rare in real life, which is where the Planet Coaster community step in with creations like this Fallout-inspired theme park. Unlike most sandboxes, this build has leftover space for you to add to at your own discretion. It also houses three solid coasters. Tiered theme parks are one thing, but this adaptation of Tolkien’s awe-inspiring, mountain-hugging city takes that concept to new heights – excuse the pun. 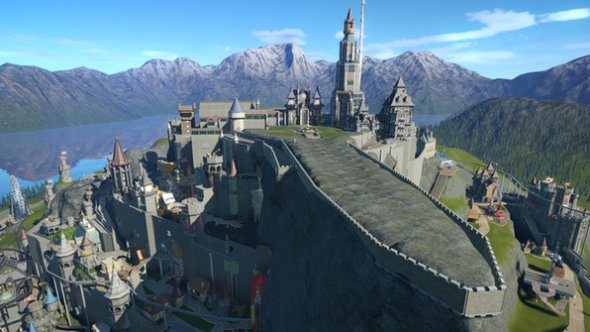 Fortunately, this creator hasn’t got too bogged down in creating a faithful recreation of the capital of Gondor, and has made sure to fill their park with things you’d expect from a theme park, like coasters and milkshake stands. Disneyland Paris is the best Disneyland, mainly because it’s near Paris. That’s presumably why this author set about trying to recreate it in its entirety, featuring Mainstreet USA, Fantasyland, Frontierland, Discoveryland Star Wars Takeover, It’s a Small World, and Alpine Land. Seen or made something special that we’ve not featured on this list? Let us know in the comments below.